Aquaphor is the secret beauty hack you need. The average human knows about Aquaphor's chapped lip-healing properties. It's made up of ingredients that help soothe cracked, chafed, and extremely dry skin. But the beauty editor in me wasn't satisfied. I decided to try it out as part of my makeup and hairstyling routine as well. And guess what? It's my new favorite multi-purpose offering. Because we're heading into fall, I've been very tuned in to the newest trends. Duh, that's my job. The wet-eye look is one of them. So what better formula to gloss over your lids than Aquaphor? Gather a bit of the product on your finger and apply straight to your eyelid. The more you add, the more gleam-y they'll look. To add a bit more glamour, you can mix the product with a smoky shadow for a metallic finish. I'm an illuminator junkie and love to highlight my cheekbones whenever possible. To add a quick swipe of dewy goodness right where the light hits, apply Aquaphor above your cheekbones for easy definition. You can contour (below the cheekbone and along your jawline) when you're getting ready for a night out. In the same way that you can use the formula on your cheekbones, you can also use it along your brow bone. It'll highlight the shape of your brows (which frame your face) and make you immediately look polished—literally. Flyaways constantly plague my life. My hair is curly, so frizz is just part of the package. However, Aquaphor works to sneakily conceal stray hairs in just a few seconds. I take a disposable mascara wand (life hack alert!) and spread some of the formula evenly on the brush. Then, I brush back along my hairline and voila! Frizz is gone and manageable throughout the day. If you ever had a gnarly cold, you've definitely dealt with dry, sensitive skin around your nose. 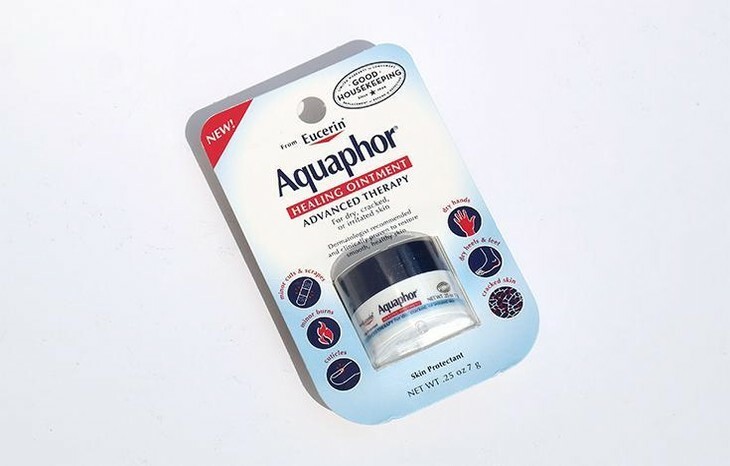 Luckily, Aquaphor works to hydrate and heal irritated skin, even on your face. Apply a liberal amount around each nostril before bed and you'll be healed by morning.